There is some truth in the common saying that all work and no play makes Jack a dumb boy, so keeping this very thing in mind, it is absolutely vital for all of us to pursue some good hobbies so that in years to come, after devoting our entire selves to our career, we do not feel like we have missed out on any other fronts. In order to become a success in your career, you have to love your job, strive for perfection at all time and also always do your best, so if you have always dreamt of turning your hobby into a business, then for your benefit here is a list of how you can go about turning a hobby into a business. The following mentioned are few tips on converting your most common hobbies in to legitimate business. One of the first things to consider before you start harbouring plans of converting your small hobbies into a business is that, Is this something you really want? Is this hobby which you have merely a passing one or is it something which you are genuinely interested and can actually see yourself doing for the rest of your life. If you are not convinced about the above then maybe you should reconsider your decision. You should be mentally prepared for the fact that once you start the business, owing to the pressure you might actually lose interest in this hobby after all. In order for you to convert your cool hobbies into a business, you have to really believe in yourself and your idea. Be prepared for the fact that things are certainly not going to be easy no matter what. The business world is a cut throat one indeed and you should not be under the impression that things are going to be a cake walk for you. So ensure that you do spend some quiet moments alone really weighing and measuring the pros as well as cons of embarking on something like this. 3. Evaluate the market or is there even a market? No two individuals are alike, or have the same hobbies and interests. Some best hobbies are common like playing an instrument, singing, dancing, recycling, gardening, drawing, painting etc, while on the other end of the spectrum there are jobs which are not so common. So you have to really evaluate the market and if at all there is a place in corporate world for a business like yours. For you to become successful you have to ensure that you do not fool yourself at any point in time. So ask yourself really, is this a service which people would actually pay for or would I just be wasting my time? In the business world, nothing speaks louder than numbers so if you wish to become an entrepreneur you have to ensure that you start thinking in this way as well. You should take into account all your expenditure and then how much you would like your margin of profit to be. Ensure that you have a neat log book to ensure that you are making a note of all your financial matters and that you are going about things in a systematic manner. Finally ensure that the price which you are charging is not too much or too little in comparison with what your contemporaries are charging. To help you make your dream come true and to get things moving it is absolutely vital that you have some idea about the ropes of the business world and what having a successful business really entails. From the looks of it running a business or being an entrepreneur might seem like a glamorous and easy job, yet in actually fact it is actually not so at all and it takes many sleepless nights to get things moving. So you can begin by taking a business course either online or even at any college. Once you get the basic knowledge you won’t feel at sea. Naturally at the very onset you might be feeling very confused about whether or not you are taking the right decision and you might be needing someone to talk to as well as to guide you along the way, one of the best things to do is to consult a career counselor who will be able to help you and assist you. He or she will be able to ask you all the questions which you have not been asking yourself and after taking a few standardized tests will let you know if this is something which you are really cut out for or not. As we are all well aware, that the business world is a cut throat one indeed and there is no one who is really your friend so rather than discussing your plans with any and everyone you meet it is advisable that you seek the counsel of your near and dear ones. No matter what happens you can always rest assured that your family members and friends will love you unconditionally, they will provide you with constant support and they will also give you honest feedback about whether or not you are taking the correct decisions pertaining to your business. Instead of straight away trying to start your business you should consider starting small with a small exhibition or sale to gauge whether or not this is something people are going to be interested in or not. You need not limit yourself to merely one sale, rather have one or two to see whether you are being able to attract any customers. Based on how well you do or how badly you perform you can actually decide to go ahead with your plan or not. Ensure that you are offering the people something novel and unique so that they are instantly drawn to what you have to offer. When you begin a business, you naturally have to ensure that above all you are happy with the way in which things are being carried out and you are also happy with the quality of products which you are able to produce. Yet what you must remember is that in order for your business to be a success you have to ensure that your primary concern is always the needs of your customers rather than your own needs. A great way to ensure that you can improve your business is by having some opinion polls and suggestion sheets where people can tell you categorically what they want. 10. Will this be a part time or full time business? It is entirely your decision, how you would like to go about starting your business, you can choose to do one of two things. First, you can decide to devote your one hundred percent to the business in terms of your money and time or secondly you could decide to try it out on a part-time basis so that in the event of it not working you do not feel too bad. You could decide to opt for one of the two methods, based on what you feel comfortable doing. Businesses do to not become successful overnight. Often they take months or even years to finally take off. So you should not fool yourself into believing that things are going to happen overnight. You will have to face a considerable number of hurdles before things actually start going your way. There is some truth in the common saying that failure is the stepping stone towards success, so you should just go with the flow and give your hundred percent at all times as well as under all circumstances. When you start second guessing yourself, things could go terribly wrong. In this day and age money as well as time are both very valuable resources and at no point in time should you be wasting either of them. So ensure that you take every business related and investment related decision very well so that you do not land yourself in any financial trouble. However what you need to remember is that though money is something which is very important, yet you should not blindly chase after it. As long as you are getting immense job satisfaction from what you are doing, money should not make such a big difference to you. Starting a business is not an easy thing to do and it involves a significant amount of risk. At the very onset you should start to calculate the risk involved in your endeavor as well as whether you are in a position to take such a risk. For a business to become successful you have to be able to take risks. You should never take risks blindly; rather take some calculated risks which could really help you. This having been said, you should not let the thought of failure hold you back in any way. You should always continue to have a positive bend of mind. Rather than being perpetually immersed in thoughts you should try and take your thoughts and put them into action as soon as possible. As we all know actions speak louder than words so try and prove your worth not through your words but through your actions. Do not let anyone tell you that you do not have what it takes to be a successful entrepreneur. For a business to become as the success you have to ensure that you are looking into the smooth functioning of all the aspects of the business. So while turning your productive hobby into a business it would benefit you to go one step at a time and take immense care over what you are doing. Your business is never going to be successful unless you are able to attract a number of customers, so ensure that from the very onset you focus a great deal of your effort in trying to advertise your business so that people start taking notice of your services and products. Last but certainly not the least is ensure that you recognize who your target audience are and try your very best to take into consideration everything which they are telling you. You should ensure that your target audience has purchasing power so that you are not unnecessarily wasting your resources catering to an audience which is never going to avail of your services and products anyway. 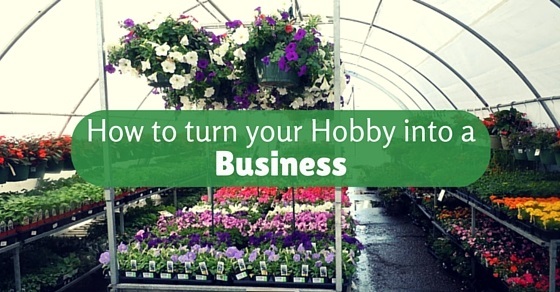 So these are some of the ways in which you can go about trying to turn your profitable hobby into a business. This is certainly not going to be an easy task, yet with your hard work as well as dedication nothing is ever impossible to achieve. It is a well-known fact that if you do not love your job, then over time to come it will most certainly be a burden on your shoulders, so ensure that you take all your career related decisions only after careful weighing and measuring so that you do not make any rash decisions.